Just as erector sets inspired a generation of mechanical hobbyists, Raspberry Pi (RPi) has captured the imagination of today’s technical minds. What’s more is that IT professionals have begun to harness the micro-computing device and apply it to real-world use. Technology blogs are filled with examples—retailers using RPis to power digital signage; office techs purposing them as print servers; network security specialists using them for offensive security testing—the list goes on. The remarkable simplicity and versatility of the RPi explains its popularity with software developers and network engineers, who are deploying it as a low-cost development platform for creating application solutions. RPi’s third build, the Model B+, better accommodates use of the RPi in technological development, thanks to added USB ports (B+ has four) and an increased number of general purpose input/output (GPIO) pins for serial communication (B+ has 40 pins). The RPi B+ keeps a price point around $35, which remains comparable to Model B (the original) and Model A (the lean version). But understand that the RPi will not be of much use by itself. To function, it requires several items that are sold separately. The following list outlines these items, as well as a handful of others that will significantly open up the RPi’s capabilities. RPi is a bare bones motherboard—a sensitive piece of electronic equipment affected by exposure to temperature, dust particles, coffee spills, and other workplace hazards. There are oodles of official and unofficial RPi cases to choose from; most are acrylic and under $10—though some designer models are pricier, like one modeled after an old Apple II computer that commands $115 on Etsy. Make sure you buy the right case for your particular model; A, B, and B+ each have different port configurations. RPi is not sold with a power supply included. Each of the models is powered by a 5-volt micro USB port, the same adapter used to charge some smartphones. Exactly how much current the RPi needs depends on the peripherals hooked up to it. For most applications, a 1000 milliamp (1A) power source should suffice, though for the B+ model it is recommended that you use a 2000 milliamp (2A) power source—especially if all four USB ports are in use. To boot up, RPi requires an SD card formatted to its operating system standard, called New Out Of the Box Software, or NOOBS for short. There are other operating systems designed for RPi use as well. NOOBS-formatted SD cards are available from the manufacturer, but formatting your own SD card is simple if you have a computer with an SD drive. An 8 GB SD card will do the trick. Visit the SD Association Web site to download SD Formatter 4.0 for Windows or Mac, and follow the onscreen instructions for formatting the blank SD card. Then download the free NOOBS software (or whatever OS you want to run), write it to the card, and eject it. It is then it is ready for use in the RPi. Note that RPi models A and B use standard SD cards. The B+ model uses a microSD card. 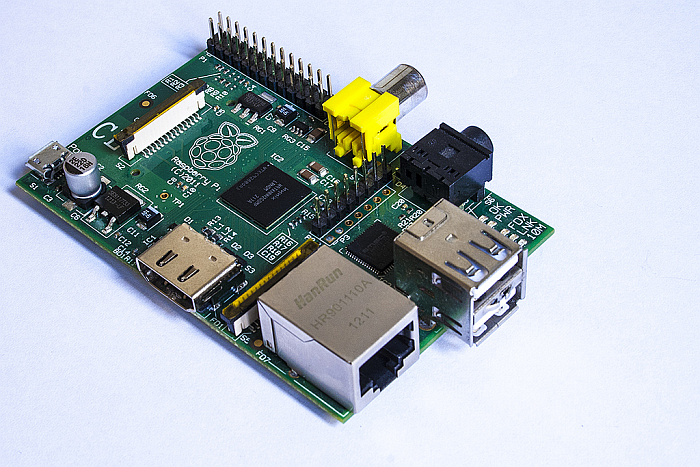 It is also a good idea to also download Raspbian, a Debian-based operating system for RPi, on another SD card. Many open-source projects available online utilize Raspbian coding due to the popularity of the Debian coding language and the vast store of documentation about using it. For networking, RPi Model comes equipped with an Ethernet post, which, given the relative size of an Ethernet cable, can prove cumbersome—especially if you want to run the RPi as a headless device. Enabling Wi-Fi is a good starter project for RPi users because it is relatively straightforward and inexpensive. You just need an Internet connection and a Wi-Fi Adapter, or dongle, as it is also called. Users on RPi discussion boards suggest the EDIMAX EW-7811Un, which plugs into a USB port to enable Wi-Fi networking. Follow these Raspbian coding instructions to configure the dongle once it is in place. If you want your RPi interacting with anything—printer, phone, mouse, keyboard, etc.—Bluetooth is the way to go. Setting up the Bluetooth dongle is similar to Wi-Fi setup: it plugs into USB, and the RPi community recommends certain models (they report IOGEAR GBU321 works well). The Bluetooth Raspbian coding is slightly more advanced than the Wi-Fi setup. While the RPi has out-of-the-box support for USB keyboards and mice, the wireless option is desirable because it leaves USB ports open for other peripherals. A Bluetooth dongle must first be set up and configured. The Logitech MK270 keyboard and mouse combo has confirmed RPi compatibility with Raspbian coding instructions online. Several users recommended this model, though others will work as well. RPi has an HDMI output for displays. The exact cable you would need depends on what you plan to use for a monitor. You can use an HD TV for a display, whereby a standard HDMI cable would fit that setup. There are other options. If you plan to run RPi on a monitor with a DVI port, you need an HDMI-to-DVI cable. For monitors with VGA only, you can use an HDMI-to-VGA cable. For analog TVs you can use a standard RCA composite video lead. This cable plugs in the RPi’s GPIO and enables it to control and communicate with another USB device. It also allows for another PC to connect to the RPi shell through its universal asynchronous receiver/transmitter (UART). This is helpful when you need to troubleshoot problems during a boot, or access RPi with a laptop when a network is not available. These are some of the more advanced functions, but there is enough documentation available to make it accessible for even a novice user. This set of peripherals should be more than enough to start customizing with an RPi. RPi was developed primarily as an IT learning tool, but its reputation as a workable real-world piece of equipment continues to grow. Whatever your IT skill level, buy Raspberry Pi to encourage creativity and thinking outside the box with your future projects. Raspberry Pi is not of much use by itself. This list outlines the extra items it requires, and others that significantly open up its capabilities.